In Mostoles, Spain we had our first get-together this school year with younger girls on October 22nd, 2001 at Our Lady of the Rosary and of Hope´s Parish. 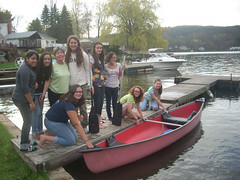 More than 45 girls – between the ages of 7 and 13 – came. Last weekend, the Servant Sisters of the Home of the Mother founded a new community in Brignano Gera d´Adda, a small town in the province of Bergamo, located in the Lombardy region in northern Italy. The town of Brignano Gera d´Adda is about 4.6 miles squared and has around 6,000 residents. 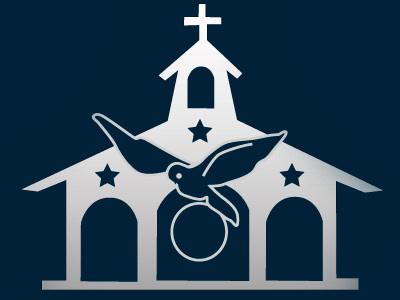 There is only one parish, Assumption Parish, which belongs to the diocese of Cremona. The first H.M. meeting of this school year took place on October 16th in Barcelona, Spain. For the past few weeks, the families from Barcelona have been ready to get rolling. Our intrepid organizers, Ana Pelaez and Olga, while trusting in Our Blessed Mother (who seems to be the one who is determined to bring the Home to Barcelona), enthusiastically began to get everything prepared. 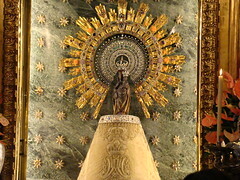 They invited a large number of people, prepared lunch, looked for a place to have the meetings and – above all – they fervently prayed to Our Lady. On October 12th, Fr. Rafael traveled with Sr. Reme and all of the novices to Zaragoza in order to celebrate the feast of Our Lady of the Pillar, the patroness of Spain. As none of the novices are originally from Spain, it was a great oppurtunity to get to know Spain’s religious culture better. 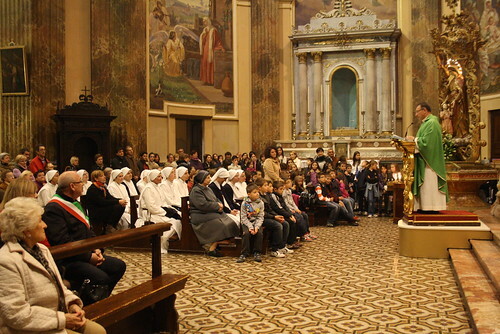 On Sunday, October 16th, the Servant Sisters in Rome, along with a group of girls, gave thanks to God while remembering with joy the past World Youth Day in Madrid. Home of the Mother, took possession of Sts. Dionysius and Pancracius Parish in Valencia, Spain. The Archbishop of the dioceses, Archbishop Carlos Osoro Sierra, entrusted the parish to the Servant Brothers of the Home of the Mother and has placed Fr. Jose Javier Martins de Passos, SHM, as the head of the beforementioned parish. On Friday, October 14th, 2011, the Servant Brothers in Rome celebrated the Holy Mass in St. Peter´s Basilica at the tomb of Blessed John Paul II. This weekend, the community of Servant Sisters in Rome – Sr. Maria Luisa, Sr. Gema, Sr. Laura, Sr. Caitlin, and Bailey – headed out to Monte Vidon Combatte, which is located in the province of Ascoli Piceno, Italy, in order to get together with other members of the Home of the Mother. On September 8th, Our Blessed Mother's birthday, Sr. Kristen Gardner and Sr. Sara Lozano took their final vows as Servant Sisters of the Home of the Mother. Summer Encounter in Mineral Bluff, Georgia. From the first to the seventh of August, the Home of the Mother had a summer camp for boys, ages 13 to 25, in Mineral bluff, Georgia. From the 24th to the 30th of July, the Home of the Mother had a summer camp for boys, ages 8 to 13, in Ocala, Florida. 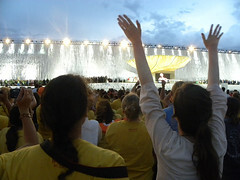 This summer we've had the great joy of being able to participate in the WYD in Madrid with Pope Benedict XVI. We had been preparing for the encounter with the Pope for several years now, collaborating in the mass media and organizing the pilgrimage and the HM Site down to the last detail. But most importantly, we've been praying that this encounter bear abundant spiritual fruits in the lives of the youth throughout the world. 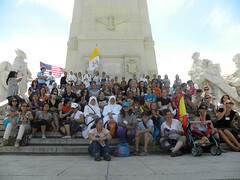 This year the Church celebrated the 26th World Youth Day in Madrid. Many young people gathered together in Madrid to participate in this event. But there are also many young people who wanted to participate but weren’t able to be there physically. Here in Jacksonville we gathered together to live this event, spiritually united to the youth and the Pope in Madrid. From Saturday, August 20 to Sunday the 21st, 11 girls and 4 Servant Sisters gathered together for the prayer Vigil and Mass with the Holy Father, Pope Benedict XVI. We began with an international dinner and while we ate, we handed out pieces of a puzzle. Each one had the name of one of the WYD´s patron saints. When we put them all together, it formed the Spanish flag with the WYD 2011 logo. Each girl read a short biography about the saint they that was on their puzzle piece. We were all impressed by the lives of the saints and their generosity. Each girl chose that saint as their protector saint for the year. Later, we decorated t-shirts in memory of this historical weekend. Then we got ready to watch the prayer Vigil with the Holy Father. The Vigil ended around 12:15 a.m. on Sunday morning. We went to bed, but got up again a few hours later, around 3:30 a.m., in order to watch live online the Mass in Cuatro Vientos with the Holy Father. Although we were thousands of miles away, we were happy to be able to participate, and in our hearts we lived it very close. It was amazing to see so many young people with so much love for the Pope and for the Church. 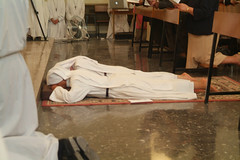 The Mass ended at 6:00 a.m. and we went back to sleep for a little while. When we woke up, we couldn’t believe the WYD had ended. But although it had ended, there was much waiting ahead. The World Youth Days bear so many fruits of life. We all went to Mass together, asking the Lord and Our Mother that the seeds planted in the souls of so many young people, and in our souls as well, grow and bear much fruit. Summer Encounters 2011 in Ocala, Florida and Blairsville, Georgia. 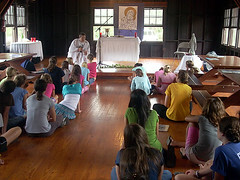 From July 24 – 30, 24 girls between the ages of 8 – 13 came to Ocala, Florida to the Our Lady of Mt. Carmel Summer Encounter. On July 16, the feast of Our Lady of Mount Carmel, 3 Servant Brothers and 6 Servant Sisters of the Home of the Mother entered in the novitiate. The ceremony took place in Torrent, Valencia. 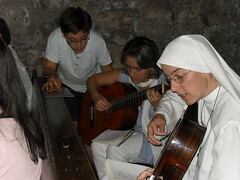 On July 2, in Torrent, Valencia, the Servant Brothers and the Servant Sisters took their vows. 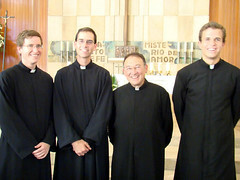 At 12:00 p.m. in the Church of the Educational Center FASTA, a total of 7 Servant Brothers of the Home took their vows. 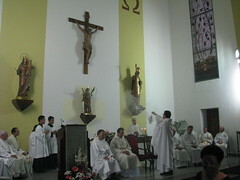 The traditional Javierada pilgrimage, which the Diocese of Getafe (Spain) organizes every year, was held April 8-10, 2011. This year in Lumezzane, for the second time we celebrated an Encounter of the Home of the Mother, or "HM Day", – a weekend especially dedicated to helping the faithful of the parish to get to know our movement, thanks to the unconditional support of the pastor, Don Tino Bergamaschi. 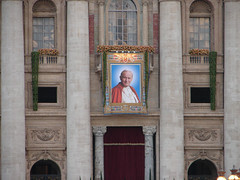 On the first of May we received the grace of being present in Rome for the beatification of Pope John Paul II. They were unforgettable days during which we rejoiced in the almost tangible presence of the new Blessed; it really felt like he was present with us. 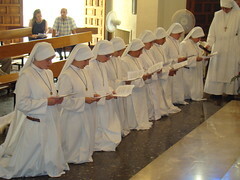 Continuing the celebration of the octave of Easter, a group of 18 sisters, together with Fr. Rafael Alonso and Esmeralda, LHM, went by car from Valencia (Spain) to Rome (Italy). It was a long pilgrimage that lasted more than 1,700 km and certainly was not lacking in discomforts and sacrifices, but it was well worth it! This past Easter Week (April 25 - May 1), the Servant Sisters of the Home of the Mother in Jacksonville organized a pilgrimage to the northeastern States. We took advantage of the fact that various high schools were on vacation that week to go and see various shrines in Pennsylvania, New York, and Massachusetts. There were 11 of us all together: 7 girls and 4 sisters.